The best ocean fishing kayak will be able to take you places you never thought possible. Fishing offshore in the open water will give you a new perspective on life. The ocean will hold larger and more variety of fish than that of smaller freshwater lakes. 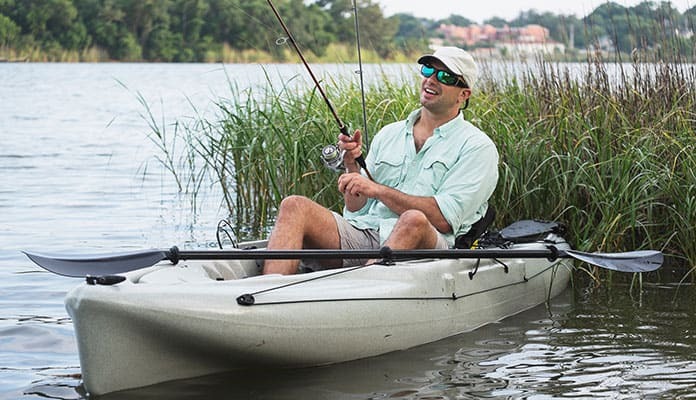 The best saltwater fishing kayaks will be comfortable and have features such as ample storage to get you and your gear to your weekend campsite. The best ocean kayaks for fishing are versatile to be functional in surf and flat water. We have done the research so you don’t have to. Here are our top 5 kayaks for ocean fishing in saltwater. There’s a reason Vibe Kayaks are gaining in popularity - they make great products. The Yellowfin 130T is a multicolored kayak that will keep surprising you even after having it for some time. This is one of the rare kayaks that can fit up to 3 people (or 2 people and a dog). With that being said, you can still ride this kayak solo if you want to. The seats have been designed to allow this option. Overall it stretches 13 feet and weighs 80 lbs. You will find it comes with 2 flush mount rod holders and 4 additional mounting points that you can upgrade over time. If you are serious about fishing you may need to grab some additional rod holders so that you can get at the fish from every angle. You will also have loads of storage options like 2 sealed hatches with bag inserts and a large bungeed rear tank well. The seats are more like ultra comfortable beach chairs. They are attached by strong lines and clips which can all be easily adjusted. The base of the seat seems to float in mid air yet feels strong and secure. A tall backrest gives you ample lumbar support without making your stroke feel awkward. The Sea Ghost 130 is a 13 foot ocean fishing kayak that is fully decked out. It weighs 74 lbs but is one of the more finely tuned ocean fishing kayaks on the market. Everything from the seat to the storage has been specifically thought through with fishing in mind. The seat has 2 positions that allow you to switch on the fly, even if you’re in the middle of the ocean. It has 2 flush mount rod holders and 4 gear tracks for the best gear configuration. This boat also comes with a pre installed rudder system which is controlled by your feet. All you have to do is simply move your feet and you’re in complete control. This rudder makes this kayak excellent at tracking even in windy conditions and places that face strong currents. If you’re someone who can’t get enough storage you’ll love this boat. It has a large center console that gives you access to your essential gear. It also has a large 20 inch oval hatch situated in the front of the boat. This is great for all your sensitive gear as it’s completely watertight. The Sea Ghost even has a bungee system right behind your seat - ideal for your waterproof duffel bag. This kayak is incredibly well known, arguably the most popular sit on top kayak in the world. 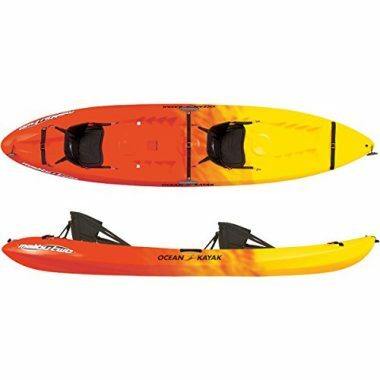 Fitting up two adults, this Ocean Kayak Malibu Two tandem kayak can even be paddled comfortably on solo trips. With the high weight capacity you can even bring your child in the center seat, or pack your pup with for a fun day on the lake. With two comfortable seats, you will be able to paddle longer and more comfortably. With overlapping foot wells, this sit on top kayak allows any size paddler to comfortably use this boat. A skid plate increases this boats durability while bungee gear straps allow you to pack all the gear you need. 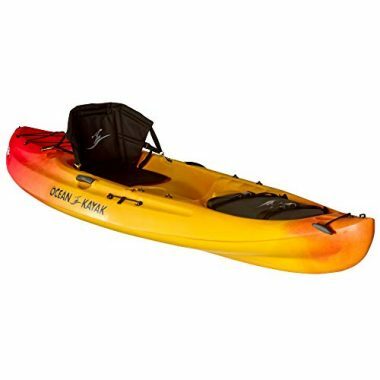 Portaging and transporting this kayak are made easy with the bow and stern easy carry handles. A third molded seat allows for the versatility to fit an extra person, or more gear on board. If you are looking for the best tandem ocean fishing kayak this Brooklyn Kayak Company option may be for you. It has quite a well designed layout if you’re riding with 2 people or just yourself. The rear seat is positioned enough in the center of the kayak that it can be turned into a traditional single seater. Each seat has its own waterproof hatch within arms reach. This means you can bring along cameras or store your wallet in a safe place. It comes with 7 rod holders, 3 of which can be articulated. This allows you to have more than one rod going at once maximizing your chances of a catch. Each seat also has a paddle rest so you can ensure your paddle stays with you when you’re throwing casts and setting up your lines. Getting your kayak into the water will also be easy with its 4 carrying handles. This kayak is smaller than most others you will find but that doesn’t mean it is inferior. This kayak allows you to bring the fun into the ocean with its responsive and stable ride. 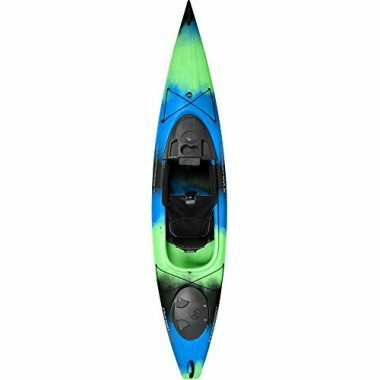 Performing well in both waves and flat water, this kayak is reliable for both kids and adults. 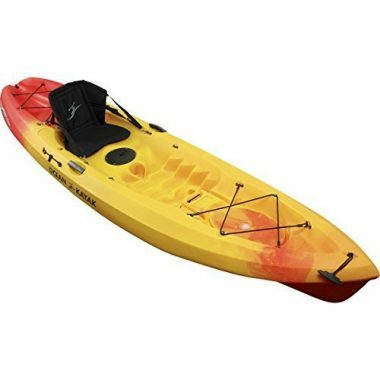 With a 4-way adjustable comfort seat, this kayak has the comfort and cushioning needed to last for long multi day trips. With a front and back storage wells with bungee straps, simply throw your gear in some dry bags and keep them easily accessible on top of your boat. Molded in cup holders assure that all your gear will comfortably fit on board and be within arms reach. The easy to use handles on the bow and stern of this boat ensures that you can easily transport this boat with you. A replaceable rear skid plate increases the durability of the boat and makes it so that your boat will last many seasons. 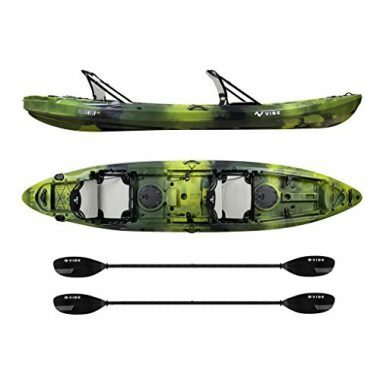 Vibe Kayaks have proven themselves as one of the better kayak manufacturers. Their Skipjack line is an excellent boat that excels when used as an ocean fishing kayak. The 90 is a 1 person 9 foot sit on top style fishing kayak. It weighs in at just 46 lbs and has great stability which is needed when paddling on the ocean. There is 6 capped flush mount rod holders that allow you to bring all of your rods with you. You can have one for every style of fishing. For example, if you love fly fishing you can bring this rod along with one for trolling and long casts. This boat can even hold your friend’s fishing rods if his boat doesn’t have a rod holder. You will be happy to know that this boat also has two paddle parks so you will never lose your rod overboard again. It even gives you the chance to bring along an extra one just in case. There is also loads of storage space on this boat including 4 sealed hatches with bag inserts along with a huge bungee system behind your seat. The 6 easy grip carry handles make getting this kayak from the roof of your car to the beach without a kayak cart. This comfortable kayak offers an incredibly comfortable foam padded seat back that adjusts 4 ways to give you the comfort and flexibility to sit for long paddles. With overlapping footwells this kayak will fit any size paddler. A 6-inch lock hatch allows you to have a place for dry storage to keep your camera or cell phone. It also has deep tank wells with bungee straps to give you even more storage. The paddle holder will allow you to free your hands making the deck space feel even bigger. With molded in side handles, transporting this kayak becomes easy. A replaceable rear skid plate allows added durability to give your kayak an even longer lifespan. 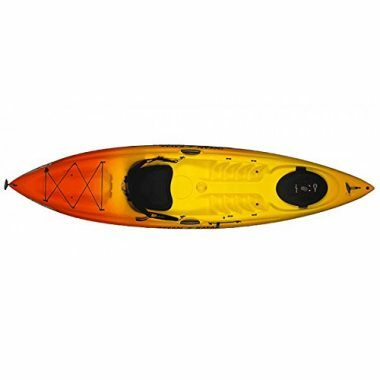 Wilderness Systems Pungo 120 kayak may look simple at first glance, but is actually ingeniously laid out. Its hull has been designed to give excellent secondary stability. Primary stability refers to how balanced you are when you’re simply sitting in the water. Secondary stability is how the boat bounces back when it’s tipped on its side. A boat with high secondary stability will bounce back without fully tipping over. The cockpit of this ocean fishing kayak has been meticulously thought out. It has a Phase 3 AirPro seating system which gives you much better support for your back without making you alter your paddling motion. The base of the seat has incorporated many different size air holes that not only allow water to drain and not accumulate but also for added ventilation. With that being said, the padding hasn’t been sacrificed for this feature. You still get an ultra comfortable kayak seat. Even though this is a sit inside style kayak you will still find ample amounts of leg room. This is because of the SlideLock XL foot brace system. It allows you to simply slide the braces to your ideal length at any time - yes, even when you’re in the middle of a lake. This boat has many places to store your gear including bungee rigging, under the deck hatches and even a special compartment behind the seat. Also, you will no longer bash your knee on the top of the boat as the Pungo has knee padding that protects you without limiting your movement. Take to the ocean with this popular sea fishing kayak. With an expertly designed hull, this boat gives you a speedy and stable ride. Multi functional, this kayak braves through rough waters while still performing in still water. With a large front hatch with easy to access internal storage as well as a rear bungee storage system, you are free to bring all your gear with you. Ocean Kayak Prowler 13 Angler has a comfortable seat you can sit in for long trips. With two rod holders and two paddle keeps you can free your hands for a leisurely day on the water. With an under boat skid plate, your kayak will last you even longer increasing durability. 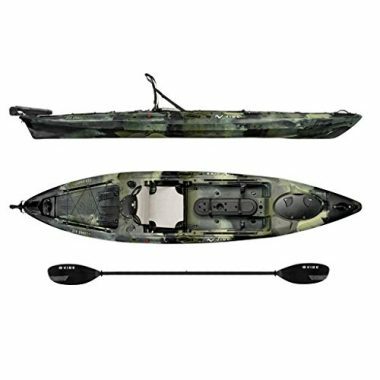 This ocean kayak fishing boat has a high weight capacity allows you to pack all the gear along with you, from coolers to tackle boxes. The Ocean Kayak Caper Classic is an excellent kayak for ocean fishing. The open design allows you to reposition your legs for those long journeys through the ocean. A large dry hatch will keep your sensitive items dry even while water is splashing over the bow of your ship while a bungee system is a perfect spot for a dry bag full of items for you to quickly grab. Small details like a cup holder and easy to use carrying handles add to this already robust kayak making it a joy to use. Don’t worry about the durability as it comes with a removable skid plate which increases this kayaks lifespan. A threaded drain plug will allow you to quickly remove the water that accumulates in the bottom of the hull. The grooved footrests ensure that no matter how tall you are your legs will rest comfortably while paddling. There are a few key things that you will want to pay attention to when looking for the best ocean kayak for you. These can seem small and not important but can become magnified on longer trips. Paying attention to the width of your ocean fishing kayak will help you to determine how suitable it is for fishing, especially if you are a beginner. Kayaks that are wider tend to offer a more stable ride than thinner models. Thinner kayaks will be more likely to tip but will move faster through the water due to less drag. Be sure to consider other factors that play into stability, such as material, in order to ensure that your model will provide the most stable ride. You can, however, count on a wider fishing kayak meaning that you will have a more spacious cockpit. This will allow you more room to move around on your ocean fishing kayak and can be a great feature when you are practicing prolonged sitting such as in fishing. This can also add to the amount of storage space you will have on board which is another added benefit to a fisherman. The weight of your kayak plays a role in how useful the kayak is to you, but not in the way you may think. While the weight of your kayak doesn’t play a huge role in its performance, it makes a big difference when transporting. Typically these kayaks way around 60 to 70 pounds. They feature a long and awkward shape. This weight does not include any accessories you add to your kayak such as trolling motors, rudder system, mounted storage, etc. Once you begin to add to your kayak, the weight can become quite extensive. Having to transfer the best ocean fishing kayak from your house to your car is hard enough. You will then have to transfer it from your car to the water and back again. You may even have to portage your kayak between different areas. This can become crippling when done repeatedly and plays a big importance in your enjoyment with your kayak. For this reason, having a kayak that features a lighter weight can be incredibly useful. Since these kayaks are highly specialized they will cost more than the average kayak. Companies take extra time and resources to plan out everything from the shape of the hull to the accessories of these fishing kayaks. Even a slight modification to the angle of the hull can have detrimental effects when you’re on the water. This is a critical aspect companies need to research and get right in the construction process. The materials used to manufacture the best ocean fishing kayak can also affect the price. Most kayaks come in a form of plastic, but the accents can add up. The seat needs to be well designed as well which can make the price of the overall kayak increase. With that being said, you will want the most comfortable ocean fishing kayak seat you can get, especially if you’re planning weekend fishing trips. Even though the best fishing kayak for the ocean needs to be on the longer side it also has to be maneuverable. This can be done in many ways ranging from the width of the kayaks to the shape of the hull and even rudder systems. Thinner kayaks will have an easier time moving quickly through the water but can be more difficult to turn without tipping. This is where a rudder system comes into play. These systems give you the most control over your kayaks. Not only do they keep you pointed in a straight line even in choppy and windy conditions, but they can also help with steering the boat. Most will have hands free ways of controlling them as well – making it a great option for people looking to fish on the ocean in their kayak. 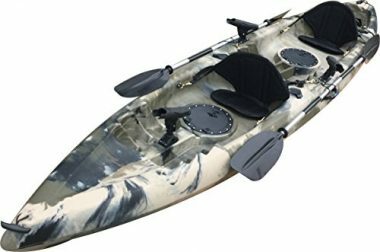 The layout of the fishing kayak will be a key factor in making your time on the water more enjoyable. Ocean fishing kayaks are on the bigger side which allows them to have loads of storage options. This can include dry hatches, bungee systems and even behind the seat nets. Most sit inside options will have knee braces which are essentially padding and support for your legs. All ocean fishing kayaks will have adjustable areas that allow your legs to extend fully and move around freely. This is a great feature to have especially on longer fishing trips. There are many factors that can affect how easy a kayak is to get in and out of the water. One of the biggest aspects is the weight of the kayak. It stands to reason that heavier kayaks will not only be harder to transport on your vehicle but also to get into the water. Look for a kayak that you are able to lift over your head without assistance. If you aren’t able to do this you won’t be able to load and unload your kayak meaning you won’t use it. Handles are another key aspect of getting your kayak into the water. Most companies strategically place their built in handles. They can usually be found on either side of the seats and in the front and rear of the kayak. This can allow heavier kayaks to be pulled behind kayak carts making them easier to get into the water from your vehicle. Ocean fishing kayaks are some of the fastest in the water. They have a long sleek shell which allows them to cut through the water with much less resistance than a traditional boat. When this is coupled with a more narrow width ocean kayaks will outpace nearly every other type. Speed becomes vastly important when you’re traveling long distances for your fishing spot. Being able to turn up your speed and get back to shore will allow you to not only travel farther to fish but also get back to the shore before darkness falls. If you are fishing around dusk or dawn be sure to bring along a light so that you can warn other boaters of your location. If you are planning on paddling with a buddy regularly a tandem is the best option for you. But if this doesn’t sound like you a single seat ocean kayak is the best option. If you are a single person in a tandem kayak it can cause some issues. One is the open cockpit. Without a spray guard, it can cause the kayak to fill with water, something you want to avoid. It can also be hard to handle since they are longer than single options. Tandem kayaks are meant to be ridden by two people. The seats have been spaced out so that nobody is in the direct middle, where you want to be when it’s just you paddling. This is where ocean kayaks differ from nearly every other type of kayak. These kayaks need to have enough stability to combat extreme surf and wave conditions that the ocean brings. This can be hard to come by since ocean kayaks also need to be narrower. But this is where secondary stability comes into play. A more narrow ocean fishing kayak will be easier to tip over than a wider one. Companies have figured this out and come up with a way of combating it. Primary stability is when you’re simply sitting in the water. The amount your kayak tips is not that much in a traditional boat. But you will in ocean kayaks. What makes up for it is secondary stability. This is what stops you from completely tipping over. It will be a weird sensation, but your kayak will catch itself when you least expect it to. There is an easy way to tell ifthe best ocean fishng kayak has good secondary stability. It’s done by looking at the shape of its hull. A more rounded or sharp hull will be the ones to look at. The hull is the shape of the curve at the bottom of your kayak. It is one of the most important aspects of your kayak that will dictate not only how fast your kayak will travel but also its overall stability. Another style you should look for is pontoon or tunnel hulls. This is when the bottom most point is actually inverted. These don’t favor primary over secondary stability and actually offer the best balance of any hull type. This increase in stability makes some kayaks stable enough to actually stand when fishing. As with any kayak that you look to buy, you will want to pay attention to the amount of storage that your kayaks have. This is especially important in ocean kayaks as you will likely be looking to pack a lot of extra gear along with you on your trip. This is largely due to the unpredictable nature of paddling on the ocean. With the currents and tides, you will want to ensure that you come fully prepared and therefore will require a lot of gear. This becomes even truer when you are fishing. While bungee cords are nice, you will want to ensure your kayak offers dry storage as well. 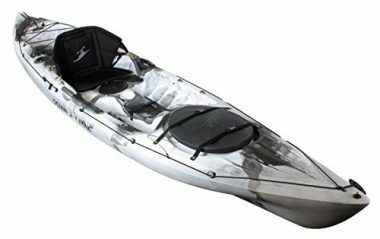 Ideally, the best fishing kayak for the ocean should have both bow and stern storage compartments as well as bungee cord systems on top. When fishing, it is ideal to store your gear and tackle in the back and reserving the front of your kayak for fish storage. Bungee systems on your kayak allow you to attach additional gear to your kayaks which becomes ideal when planning to enjoy overnight camping. Every single inch of storage becomes necessary when you are planning long weekend fishing trips. You will have to pack in and out all of your gear including tents, sleeping pads and even your food, not to mention your fishing rods and other gear. The seat of your kayak is one of the most important aspects when it comes to fishing. We all know that fishing takes time and patience. But if your seat isn’t comfortable both of these things will seem secondary to your discomfort. Be sure to ensure your kayak comes with a seat as some don’t. On top of this, ensure it is comfortable. You can do this by making sure it is completely adjustable and has extra padding. Being able to change positions and adjust it on the go may seem insignificant, but can add another dimension to your fishing. Sitting in one position can cause you significant discomfort through your back and legs. Shifting your seat into a more reclined position can reduce this discomfort and make you able to sit for hours longer. Companies have also learned the strategic areas to add padding. Some even use specialized materials that make padding more firm or softer depending on which part of the body it’s against. Kayaks have many uses and designs. 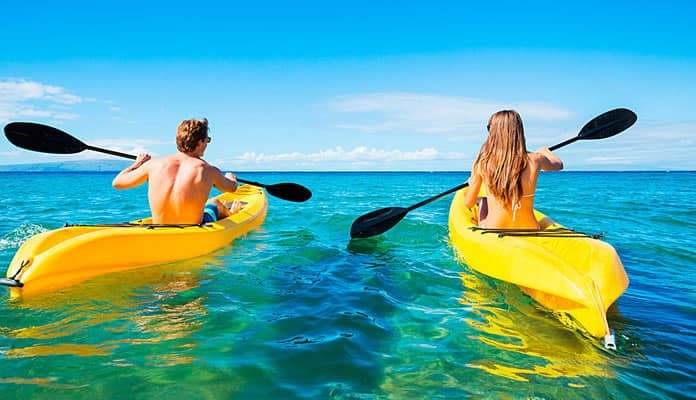 What makes the best ocean kayak will differ from the best recreational or sit on top kayak. The vastness of the ocean will undoubtedly make you feel very small especially sitting in a one person kayak. Swells become massive without the cover of an inlet or bay. The length of your kayak will do its best to combat both of these. Look for an ocean kayak that fits in the 15 to 20 foot range. This will make ascending large swells easier and not feel as small in the ocean. Since you will more than likely be traveling longer distances than in fresh water ample storage is necessary. Dry storage is that which keeps your items free from water, even if you overturn your kayak. Bungee systems are also a key feature that will ensure you have quick access to your most needed items such as water and snacks. Comfort is the most important thing to consider when purchasing an ocean kayak. Traveling long distances in a cockpit you feel claustrophobic will not translate into a fun trip. Try to find a kayak where you can sit comfortably and move your feet around easily. Being able to travel with blankets around your legs will make the early morning or end of season trips that much more enjoyable. Most kayaks are made out of a polyethylene material. This is a lightweight, durable plastic that does a good job resisting dings and dents caused by the shore. It can be warped if left in the sun for a prolonged time so we suggest storing this type of kayak undercover. High-end fiberglass is another common building material. It is more lightweight than its plastic counterpart but is more susceptible to damage. That being said, fiberglass is exceptionally easy to repair which gives it a lifespan of up to a decade. Kevlar and carbon are the highest end materials you can get for kayaks. They are ultralight and super durable. Expect to pay for this type as the material used is vastly more expensive than that of fiberglass and plastic. Q: Where Do I Keep My Catch? A: The ocean is full of fish so with any luck you can expect to be bringing home a fair amount of catch. You will need somewhere safe to hold your catch while you are kayaking. Due to the currents and the waves, having somewhere secure to put your fish will allow you to paddle safely without worrying too much about your catch. Where fisherman put their catch varies greatly. Some fishermen brings along milk crates or other buckets that they secure to their kayak. With the help of bungee cables these fisherman harness the bucket to their kayak which allows them a safe place to store their catch. While this is useful, there are other options. A lot of fishermen use their internal storage to house their catch. Lining the front storage hole with a black bag and then using this area to put your fish is also quite common. This allows you to seal up your catch while you are braving the currents back to shore. If you are in an area where there aren’t lots of sharks around, you may want to store your kayak in the most convenient place of all: the ocean. You can do this by slipping a line through the gill and mouth of your fish and then stringing them to your kayak. You then can let them drift behind you in the water as you continue your day. The downside of this is you risk losing your catch more so this way than with any other on the list. Q: Is it Okay To Buy A Cheap Ocean Fishing Kayak? A: Ocean fishing kayaks require a lot more technology than average kayaks. 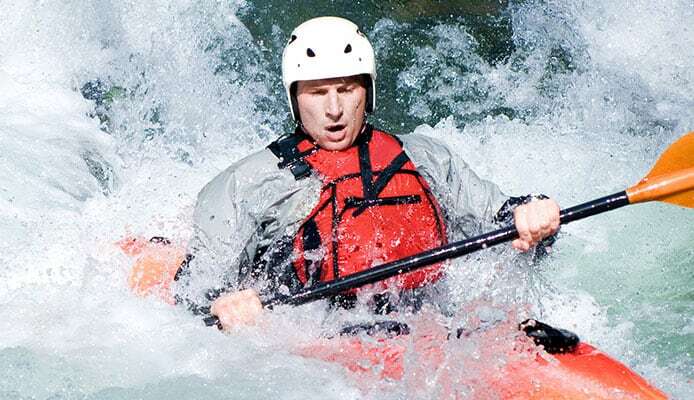 A kayak intended for large bodies of moving water, such as the ocean, will require far more advanced features than kayaks meant for calm small lakes. Typically this will be in the form of a longer design that cuts through the water with ease. You will also need your kayak to be properly outfitted for your desired use: fishing. Due to this advanced technology, you will require a higher quality boat. While we do understand the reality of budgets and appreciate their importance, we don’t recommend getting the cheapest kayak on the market. Instead, opting for a kayak that is in the mid range mark will make it so that your money ends up going farther. Realistically, this has everything to do with your safety and with the durability of your kayaks. You will not want to get a kayak that is only going to last you for a season or two. Q: How Much Storage Space Should I Have? A: When heading out to the ocean to fish, you can bank on having a lot of gear with you. Fishing requires a fair amount of gear on its own but when you are on the water you will need to bring along even more. For this reason, we recommend placing a significant importance on storage space when looking to purchase the best sea fishing kayak. As a general rule you can accept that the more storage the boat has, the better it will be. Some fisherman even choose to opt for tandem kayaks that can be paddled by a solo kayaker in order to get additional storage space. While this will deliver significantly more room it is typically not needed. When looking for your boat you will want to ensure that it offers both bow and stern internal storage. Open the lids and check to see how much space is inside the compartments. Next, you will want to ensure that your kayaks offers significant bungee systems on deck. Will you be able to easily attach a lot of gear on top of your boat as well? Lastly, consider how much space is in the cockpit with you. Are you able to store any other gear in the cockpit alongside of you as well? 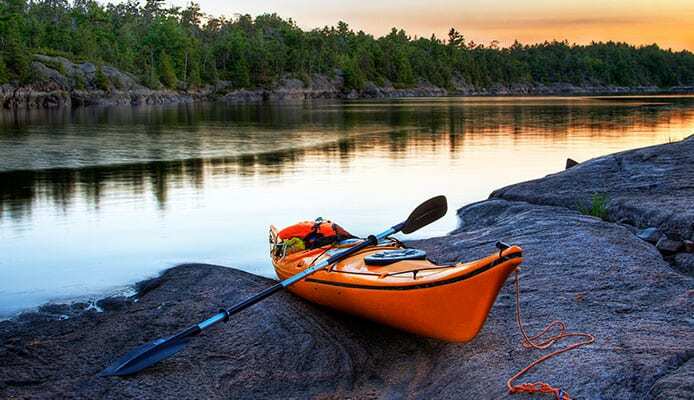 If your fishing kayak features additional storage, such as small compartments to place personal gear such as cell phones, that is an added bonus. While it is easy to say that more is better, the truth is it comes down to personal preference. If you are known to pack light, you may not need as much storage space as another fisherman. If you go for shorter trips you will require less space than someone planning to go out for the whole day, or for overnight trips. The type of fishing you plan to do should also factor into the equation of how much space you will need. Q: Is It Easy To Fish On An Ocean Kayak? A: Ocean kayaks are built to be stable. 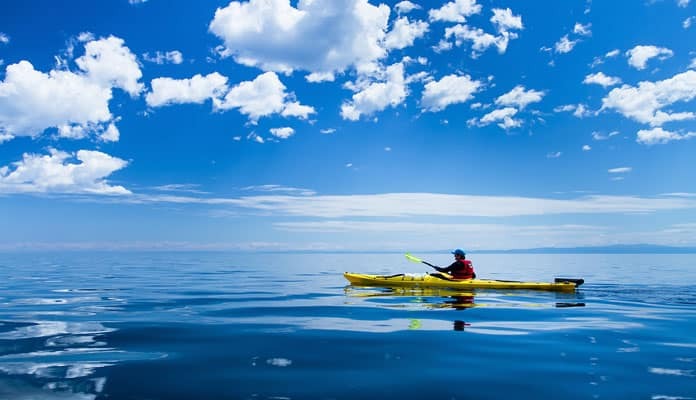 The water in the ocean is known to be choppy which is why ocean kayaks harbor special technology to help keep your kayaks from capsizing in the water. The stability makes fishing on these kayaks much easier. Sea kayaks are also generally much longer in length which allows them to pack even more gear which is very useful for fishing. Throwing casts on a kayak isn’t much different than on the shore. Q: How Can I Know If I Can Use A Kayak In The Ocean For Fishing? A: Most kayaks that have been designed for ocean fishing will have a wide body and be on the longer end of the spectrum. An increased width will give the kayak additional secondary stability. This means the fishing kayak will be able to tip in the water without fully falling over. Large ocean swells will make this a requirement for the kayaks to be seaworthy. Secondary stability will also give you extra confidence when it comes to throwing your casts. You won’t have to worry too much about bracing yourself when preparing to cast or reel in your catch. This is great for a more relaxing time on the water. Most kayaks that are designed for use in the say will advertise this in the name. If it isn’t that straight forward, you will still find some visible cues that will allow you to identify it. These kayaks typically have a flared bow. This feature allows you to easily glide overtop of larger waves rather than cutting through them. In addition to this feature you will want to look for personal suitability for fishing. Do the kayaks you are looking for offer adequate space in the cockpit? Are you able to spread out and move around comfortably for the long term use that fishing requires? How about storage space. Do the kayaks you are looking to provide a good amount of storage that will allow you to bring along all of your gear? Is it equipped for fishing in terms of rod holders and paddle clips. Answering these questions is a great way to consider whether the kayaks you are looking at will be a suitable option for your next ocean fishing adventure. Q: Should I Go For Sit-In Or Sit-On-Top? A: Each of these types has their pros and cons. A sit inside style is great for things like rivers and white water. These will allow you to also go in high surf conditions without getting wet (with an addition of a spray guard). Most of these kayaks have some dry storage for your sensitive electronics or extra gear. They may not have a bungee system which can leave them lacking in the storage department. This style is also ideal for beginners as they allow you to have a lower center of gravity and therefore a more stable ride. A sit on top type fishing kayak will have a more open deck. In fact, your legs will be completely exposed. This can give you more open storage in the way of bungees and deck space. But it may lack dry storage like hatches. The best kayak for ocean fishing will allow you to paddle for prolonged periods of time in comfort. Lots of storage space, a comfortable cockpit and a durable frame are key aspects that you should factor into your decision. The best ocean kayaks for fishing can maneuver through the unpredictable surf of the ocean as well as being reliable for a straight ride through the lake. Have an ocean kayak on our list? Let us know what you think in the comment section below.